Remember the Vuvuzelas from the 2010 World Cup in South Africa? Those long plastic tubes that emitted a sound so deafening that the networks had to adjust the sound from their broadcasts because of viewer complaints? To me and many other casual soccer (football for the rest of the world) fans, those horns were the enduring image of that World Cup…the Vuvuzela World Cup. 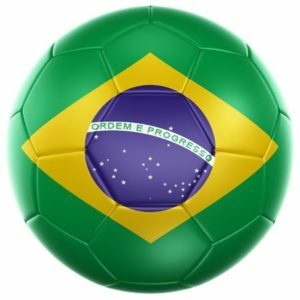 Could the 2014 Brazilian world cup be the Connected (World) Cup? The Internet of Things World Cup? Consider this article from The Creators Project. From the ability to track the ball within millimeters to figure out if that shot did actually cross the goal to mind controlled exoskeletons which will help a young paraplegic walk and open the ceremonies, it is certainly shaping up to be just that. No more ticket takers, the turn stiles are automated. iRobot has provided remote controlled security robots. The Italian team has even provided an ATM-like card to their players, which provides them everything they need to know about the tournament from strategies to motivational speeches. Even the teams trainers are connected as many players are wearing devices on their thighs so the staff can determine how well hydrated their players are, how strong they are and even how motivated. Mind you, making this the most connected World Cup (or event) in history was a very long time in the making, right down to the first sponsor of this world cup. Speaking of which, do you know who the first sponsor was? Adidas? McDonalds? Visa? Or any of the other usual suspects? Nope, it was Oi, a company very few Americans have heard of. Oi is the largest telecommunications company in Brazil. Clearly connecting people and devices was part of the DNA of this World Cup from the get-go. For techy guys like me, it’s always exciting to see the new and unique ways technology is deployed in the world and major events like the World Cup are often exhibitions for just such things…especially if it is used to stop people from using Vuvuzelas.